The other day I was in the local thrift store looking for something I needed, and ended up with something that I did not need. I bought it anyway, because it reminded me of someone I used to know long ago. The item was three 1970’s Colonial Park Lane water goblets. I’m not a fan of this particular style. They are much too small, and awkward to hold, unless you are a Hobbit. No, I would not recommend them. Patricia G, was one of the travel clients of the family business, who quickly became a close friend of the family. I’ll never forget the first time I visited her home to deliver airline tickets. Yes, her house was green. But nothing seemed particularly out of the ordinary ─ EXCEPT ─ when we rang her door bell, instead of the standard yellow or orange glow, it had a green one! I am NOT! kidding. The sight of that glowing green orb made the hairs on the back of my neck stand straight up. My tongue went dry and my fingers curled a little tighter around the airline tickets. I had a feeling something was going to be different about this client! Standing in front of us, framed in a backdrop of countless shades of green, stood “The Lady in Green.” She was elf-like; her features sharp and delicate. Think Audrey Hepburn, but all in green. And yes, everything she wore (including her tortoise-shell glasses) were green! I was mesmerized by the woman standing before me; something was triggered in me. My trance was momentarily broken by mother grabbing me from behind, and stepping forward to introduce herself (and her half-witted, daughter; the still mesmerized me). All I could do was nod, and partially close my mouth. I noticed that my mother, too, was dazzled by this exquisitely dressed “woodland creature” I had already named The Lady in Green forever. Fortunately for us, The Lady in Green invited my mother and me into her home for a glass of tea. Now, before I launch into detail about her house, I just need to tell you that if you guessed that everything in the house was green, you would be correct. Well, with the exception of the family dog, her children’s rooms, and the black-and-white checkered floors in the living room. EVERYTHING WAS GLORIOUSLY GREEN! The Lady in Green seated us in her kitchen, where we sat on these mint-green enameled, metal-looking stools, which resembled praying mantises. Directly in front of me, sat a small television encased in plastic the shade of “army” green. If there ever was such a thing as a “cute” T.V., this one was off-the-charts cute. As I looked around her kitchen, I suddenly realized the mundane had been transformed by a single color, and done so, beautifully. Especially the contents of her kitchen cabinets. 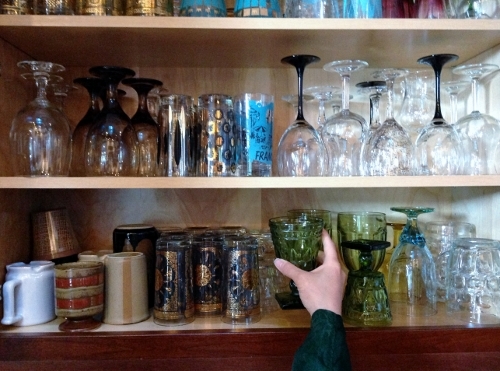 All of her glasses… in every shape and size, were all drenched in liquid Jell-O lime-green. I was in green heaven. Her living room was also a kind of shrine to the color green. I was beginning to think The Lady in Green really was a woodland elf. She had a baby grand piano in the corner. Guess, the color? And her sofa ─ a perfect shade of moss-green. The objects on the mantel and on her coffee table, were layered in tones of green that sparkled with an odd kind of magnificent brilliance; like genuine souvenirs straight out of the Emerald City at Oz. I understand now, that nothing in her house was gratuitous. 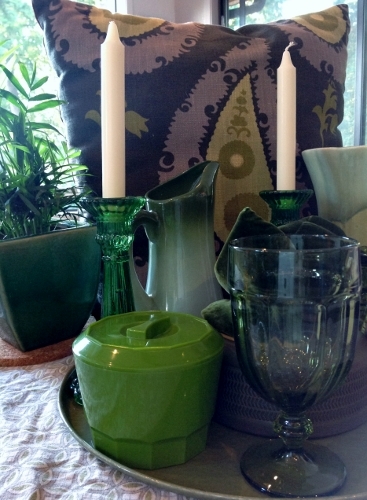 In other words, she carefully chose each item that best represented her passion for the color green. The Lady in Green collected and curated this color like no other person I’ve ever known. Most people would never pay that much attention to a single color. Yet, she did. And she did it well. I regret to this day, that I never asked her why she loved the color green so much. I wish I had. The whole idea of submerging oneself in a single color, might be a bit too much for most people. I might agree, to a certain point. Nonetheless, The Lady in Green woke me up to the countless possibilities that a single color could achieve. It’s like looking at a color for the first time. Thank you, Lady in Green. I smile and think of the Lady in Green every time I reach for one of these goblets. So, remember those Colonial Park goblets that I didn’t care too much for? Well, they sit proudly in my kitchen cabinet with their stout little-avocado green chests puffed out because they are in the most prominent place. I can’t help but smile every time I reach for one of those goblets and fondly remember the collector who had a passion for the color green. 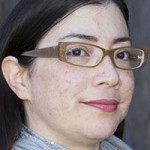 Julie Cunha Interiors, ­specializes in expertly edited restyled vintage and modern interiors. She lives and works on Whidbey Island. To inquire, or make an appointment: Juliecunha5@gmail.com or cell, (360)969-9921. These green goblets remind me of my grandma. I think she had these same goblets!